Last week I turned 45. And my family forgot to take time to make me a cake. Or take me out to eat. Or get me a gift. My parents didn't call me. My husband spent more time on his break talking to friends than he did calling me. No handmade card from my youngest. No balloons. No streamers. I got more attention and gifts from my coworkers and friends and Facebook and the man who pumps my gas than I did my own family. I bought my own cake. We ate eggs and toast. It was weird. And to be honest, very disappointing. I am not a good martyr. 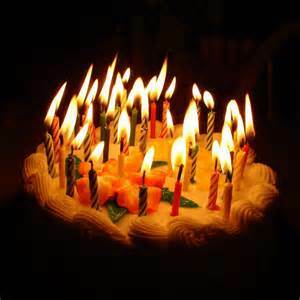 I selflessly take time to make everyone else's birthday special, so I was very sad that my family did not do that for me. But then God really convicted me for my selfishness. Big time. My pity party become a pit in my stomach. Instead of being thankful for all the blessings in my life, I spent the day feeling sorry for myself. I wasted hours of my precious life pouting. Acting like a four year old. I am not proud. So let me take a moment to publicly apologize. To my handsome husband: Thank you for being faithful, and for being contrite about forgetting, and for listening to me whine and complain and fuss that day, and for promising to make next year better! To my gorgeous, healthy children: Thank you for the hugs, and the laughs, and for coming to spend time with me! To my awesome friends and family who did take time to wish me a Happy Birthday, or give me a gift , or a phone call: Thank you! The gifts were an awesome surprise and your wishes made my day more special than you will ever know. And finally, to my Lord and savior Jesus Christ: Thank you for forcing my flawed soul to empty me of ME, and for loving me despite my big ol' pouty face. I'm very proud of you for turning this around. This would be very hard for me! Not happy that you are younger than me! 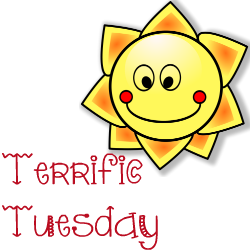 ;-) THANK YOU for joining Terrific Tuesday! Nope, didn't read this until today, Wednesday. And I'm with Amy, way to go, turning it around. I'm with you in that I don't expect the Moon on a Platter, but it's pretty nice to be remembered by those who we expect to remember on our birthdays. And pretty pitiful (to us, anyway) when that doesn't happen. I'm glad it's just a day, just one more day, marking time and giving us a reason for goals, for mile-markers, and for reflection. I'll tell you this: You've done SO much with your 45 years, so incredibly much, for better or for worse. And of all you've done, it's ALL made you who you are: An awesome Mama to your children and older sister, an example of Faith and perseverance, a child of the Most High God and one who shouts it from the rooftops. I'm more proud of you than you will probably ever know; so grateful that God chose you for my little sister, and for His binding us together in a way that NOTHING could put asunder.